Site discovered by Betty Moore in March 1951; ASA assisted with the Southwest Museum excavation directed by Ruth DeEtte Simpson (Simpson, 1961). 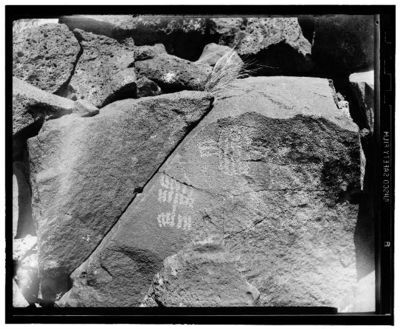 Photographs of various geometric petroglyphs; designs include linear, curved, rake-like, and lines within borders of various shapes. The group of petroglyphs in ASA001-714 and ASA001-716 is shown on Plate 12A of Coyote Gulch (Simpson, 1961).